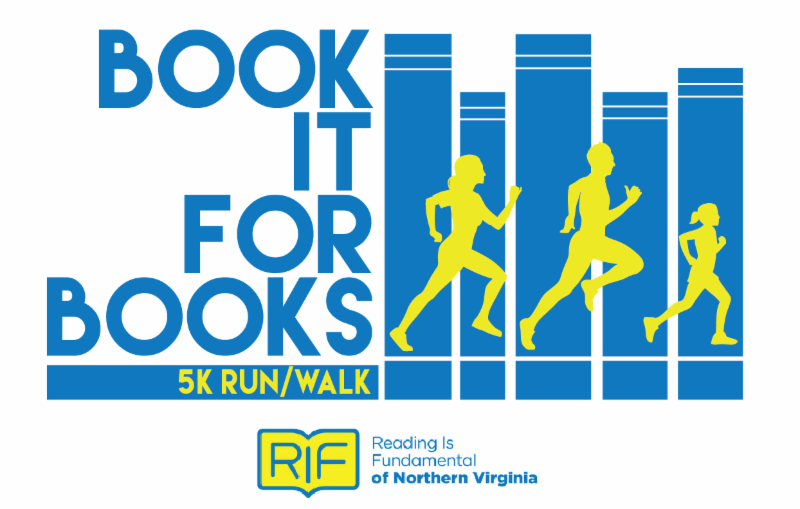 By all accounts, the Book It For Books 5K/1-mile Fun Run was an unqualified success! Even the threatening rain held off -- thanks to the literacy gods, no doubt! 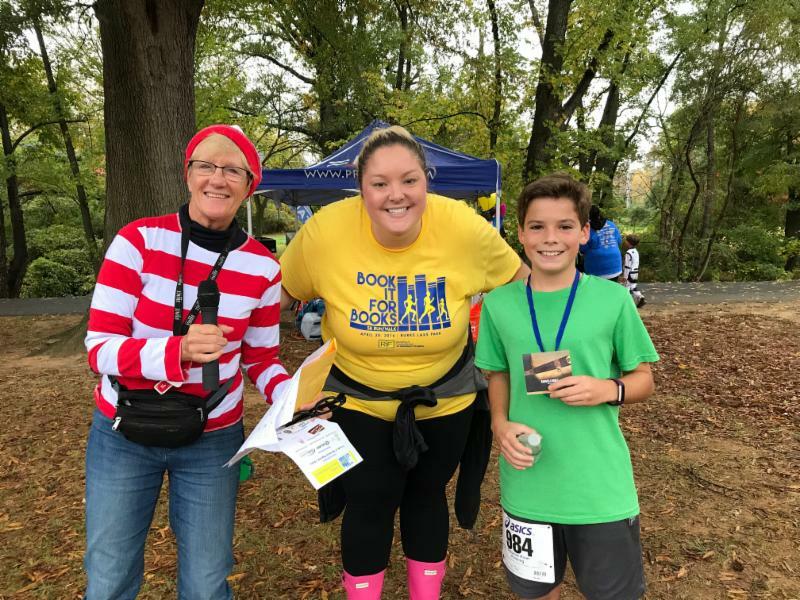 There were serious runners, kids and families, a RIF of NOVA school team, participants in favorite book character costumes, and fun for all! This special edition RIF RAP photo review tells the story. First, the 5K runners...and they were off! Then the 1-mile runners and walkers -- no less serious! 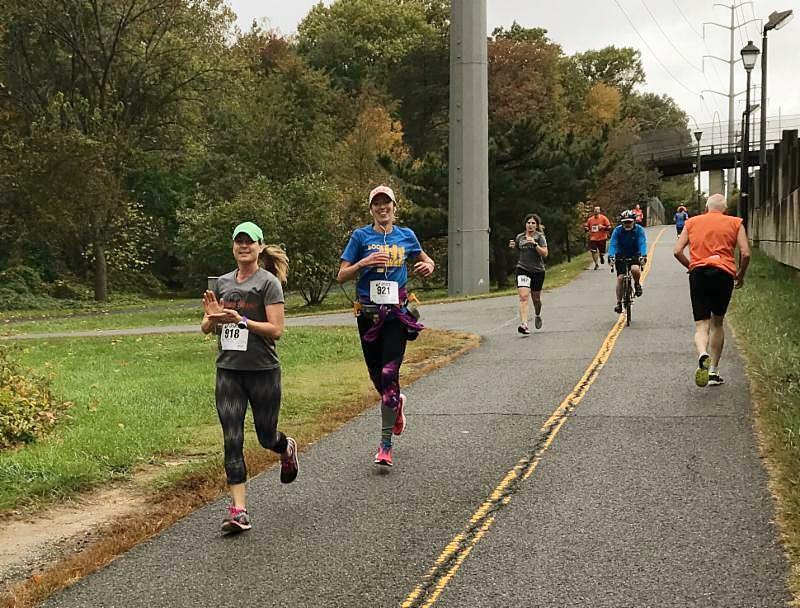 On the W&OD Trail, Chellye Promen (l, green cap) led the pack and was the top female 5K finisher, with a time of 26:27! The top male finisher was Edgar Gil Rico, with a time of 20:29. He was, as they say, bookin' it! In the 14-and-under 5K category, the winner was Justin Melly, Swanson Middle School 6th grader. He is seen here at right, receiving his award from board member Lisa Keathley (aka Waldo, left) and Stephanie Berry, RIF of NOVA advisory board member. Jason's time was 24:21! Whoo hoo! A team from Patrick Henry Elementary School (Alexandria) brought cheer to the day! 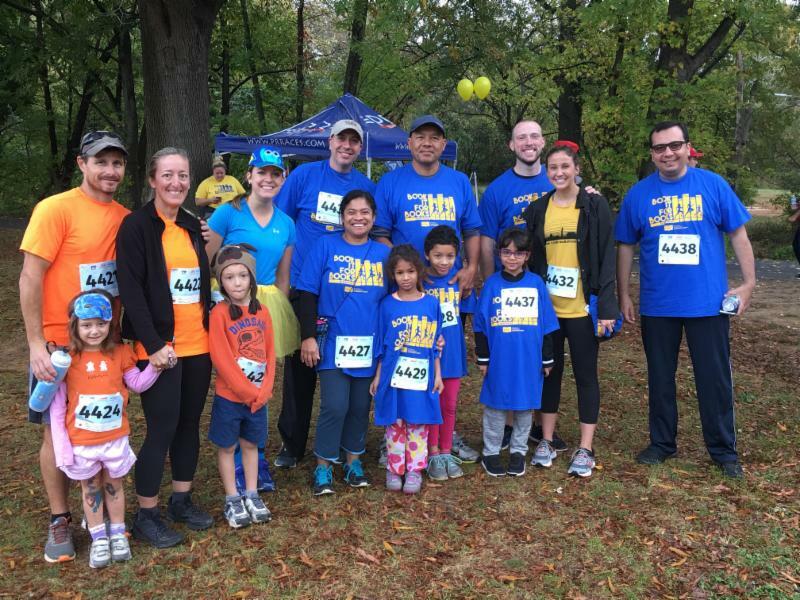 The team was led by RIF of NOVA liaison and library media specialist Kelsey Frey (second adult from left) and third grade teacher Lindsay Skolrood, in the aqua shirt and cap. 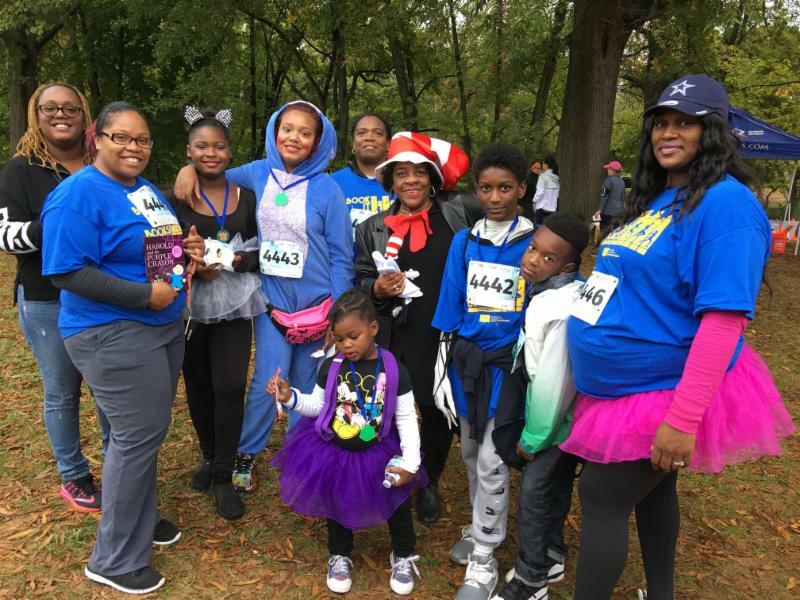 Team Harris, with RIF of NOVA board member Hazeline Harris in the Cat in the Hat chapeau, also brought smiles to the day as they posed for the paparazzi for some after-the-race shots! 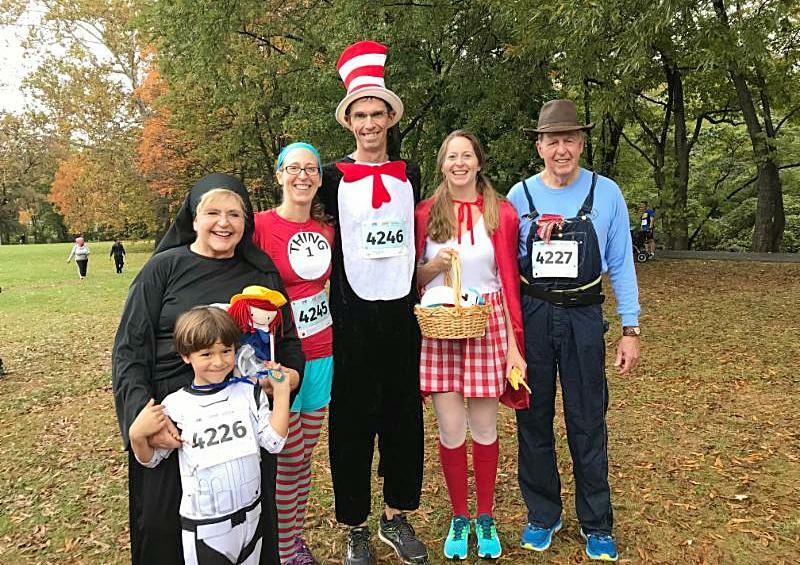 For the McLaughlin family, it was a total family affair, led by RIF of NOVA board member Christine McLaughlin as Miss Clavel from the Madeline series. John McLaughlin (r) was a Bestseller level race sponsor. In between are daughters Maureen as Thing One, Anne as Little Red Riding Hood, son-in-law Brian Taylor as Cat, and grandson Colin, 5, as the best Star Wars Storm Trooper ever! 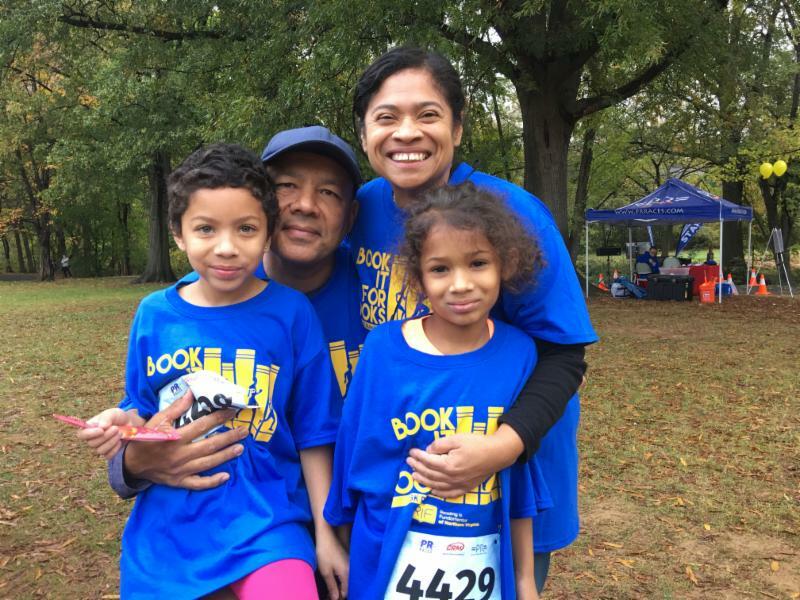 Pictured above, a Patrick Henry Elementary School family, with dad Nelson Sequeira, mom Ofelia Oronoz, and daughters Aura, 7, and Esperanza, 6, displaying their Book It T-shirts. Special thanks to RIF of NOVA friend Barbara Bankert for getting the shirts signed, sealed, and delivered on time and looking good! 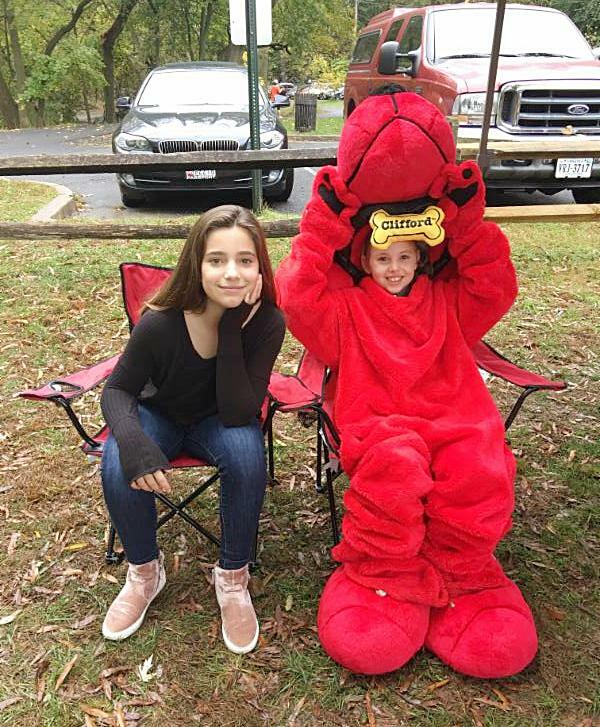 Daphne Confalone, 11, posed with Ari Watson Godfrey, er, Clifford, age 9. They are granddaughters of board co-president Nancy King and board member Ann Godfrey. 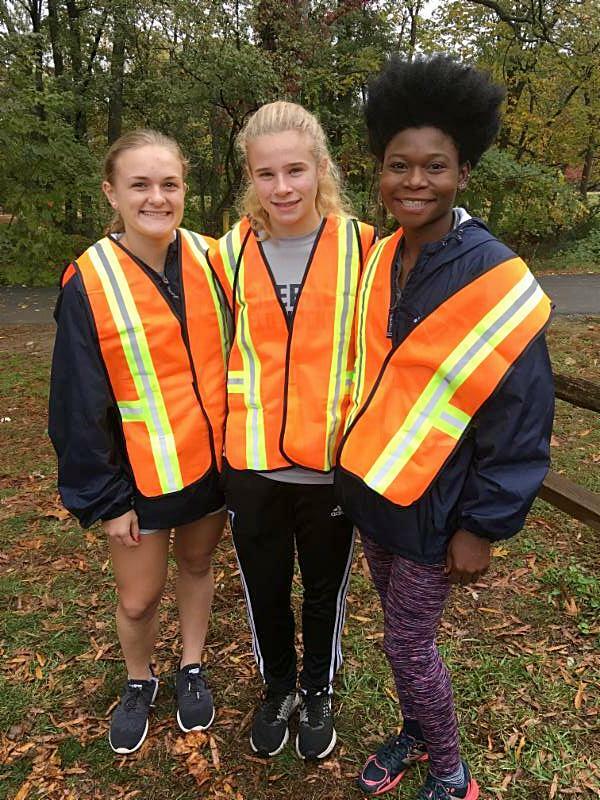 Members of the Washington & Lee High School field hockey team volunteered their time to help with the race's success! Thank you! A great day for a costume! 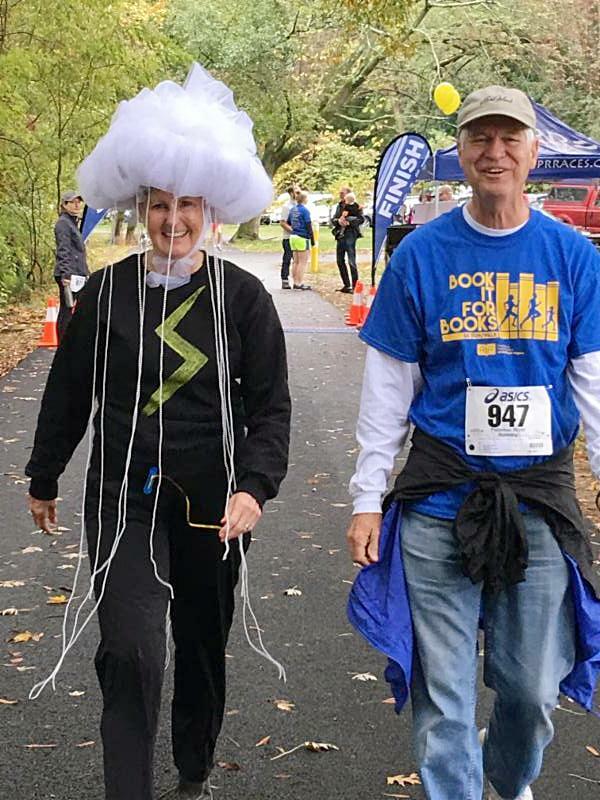 Board member Mia Mason came dressed as a cloud -- the day's most clever costume -- in honor of the Eric Carle book Little Cloud. She is pictured here with RIF of NOVA friend Bill Gardepe. One of our smallest walkers was dressed as Little Red Riding Hood. She was not quite sure about meeting Clifford, so her dad did the "introductions." 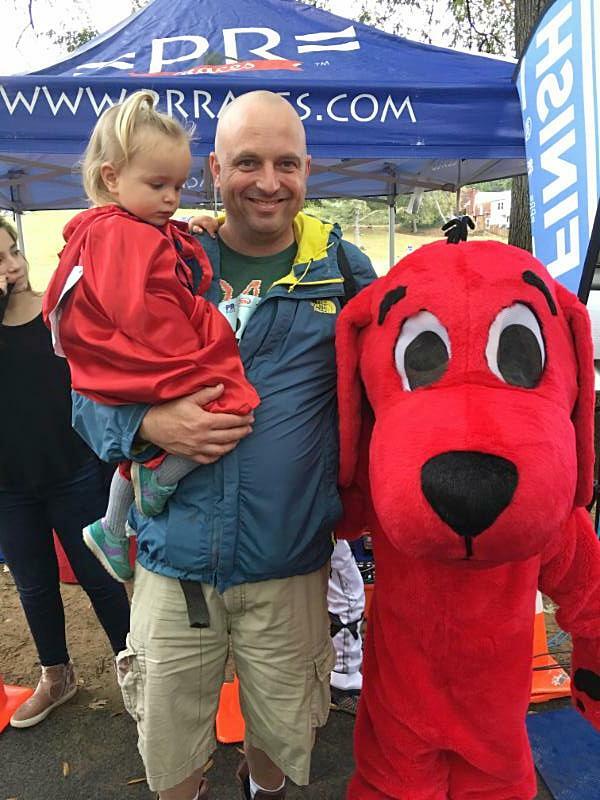 Clifford was a big hit with the kids! 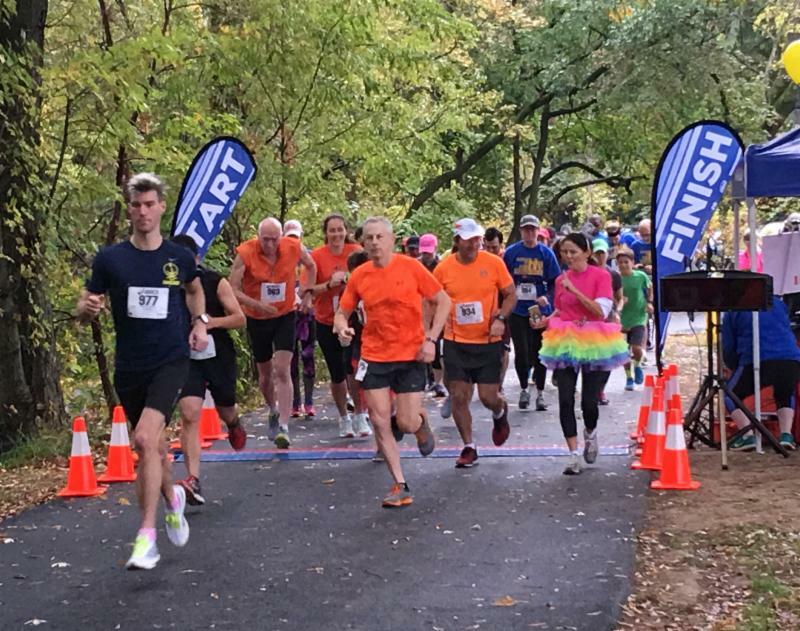 To all who participated, sponsored, ran, walked, donated, helped, and cared, we can't thank you enough for making our Book It For Books event a day to remember! A full list of sponsors can be found at the RIF of NOVA website: www.rifnova.org . Thank you SOOOOO much! Mark the date! 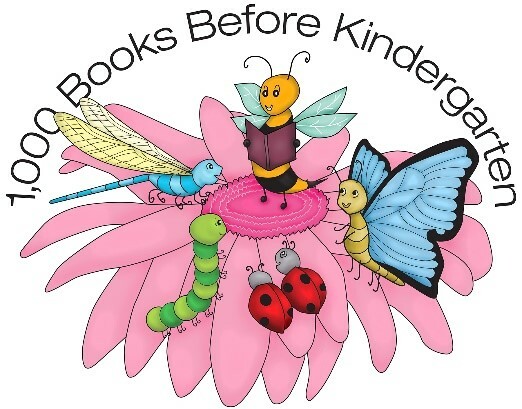 On Saturday, November 4, all Fairfax County Public Libraries will feature 1,000 Books Across Fairfax, an all-day read-in to celebrate the one-year anniversary of the 1,000 Books Before Kindergarten initiative. 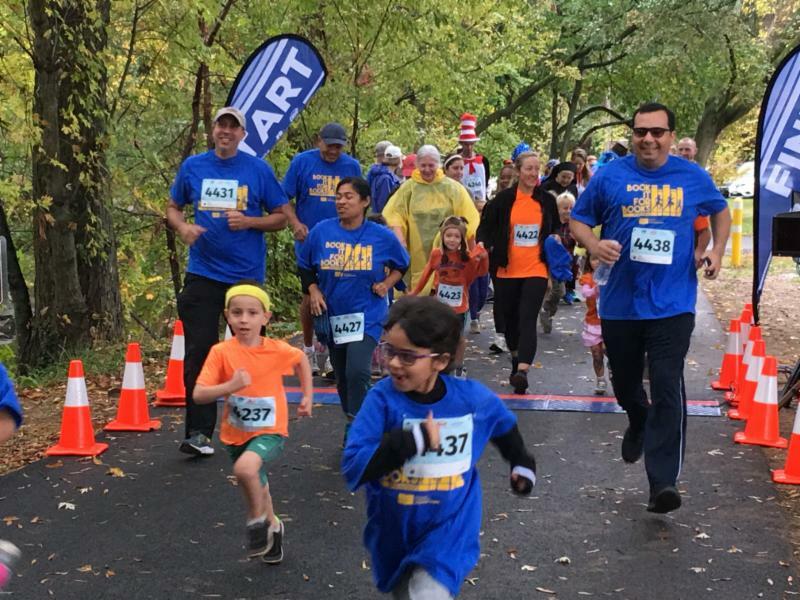 Congratulations to the 5,742 Fairfax County children already participating in the program! Details vary among branches; check out your local library info here. Please share the RIF RAP ! Forward our newsletter to your friends and anyone interested in providing books to children who need them! Subscribe here !